Whether we like it or not, a part of us thinks life can go on forever. It's the one guaranteed ego trip everyone takes. There's a limitless vanity that we attach to our lives, thinking death can never find us. Throwing mortality some shade is common. A ruthless urge to believe in the next day that creates a deception inside of us that only leads to betrayal. As history can attest and the future can mortgage a bet on, we are ultimately wrong. Kent Jones, a seasoned documentary filmmaker, explores the fear and effect of mortality in his dramatic feature debut, Diane. 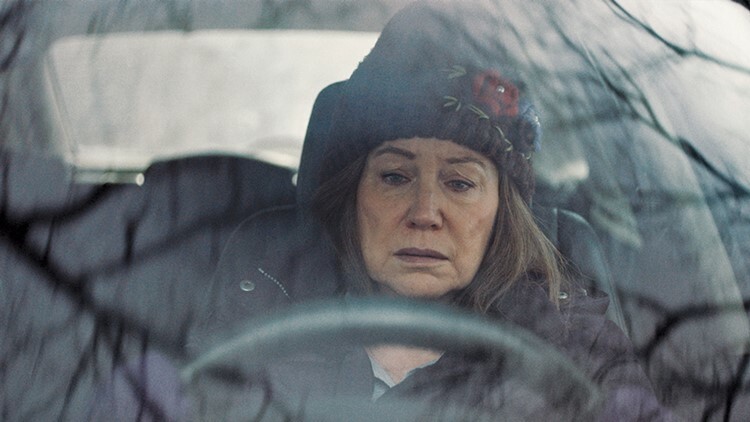 Featuring a wonderfully nuanced and alive lead performance from Mary Kay Place, the film follows one woman's world for a series of moments spread out over years. Working from his own script, Jones crafts a heartfelt indie experience that feels lived-in. Diane's life has been spent servicing others, whether it's friends, family, or strangers. She stops off at the hospital to see her cousin, Donna (the sublime Deirdre O'Connor), who has cervical cancer. She eats lunch with her trusted friend, Bobbie (Andrea Martin, a trustworthy face), every week at a restaurant they both hate but have entrusted their stomachs to anyway. She volunteers at a soup kitchen, feeding homeless and the financially depraved. There's also baked goods for sick family members, constant driving to here and there, and it's every day and all day. Diane's biggest weakness, however, revolves around her son (Jake Lacy, a master in nervous young energy), who is fighting a drug addiction; a boxing match he is losing points on while avoiding the fatal knockout punch. She feels contempt for him, being her only child, but she can't accept that he's too worse for her wear. She goes to his apartment, pleads with him, and leaves disgusted or angry with not him, but herself. You see, she is one of those people who thinks her lot in life is helping others, and when she can't, it's her fault. It's a wicked brand of shame that doesn't relent due to the carrier of the albatross. Diane gets advice from her friends and tries to cut the chord(s), but she can't. In some ways, Jones' movie is a triumphant story that also manages to not be the easiest movie to sit through. When you tackle the idea of loss, regret, and death, cheery happiness and joy can only slice through your film like partially invisible hammers on occasion. Contempt and brutal honesty are your main courses if you want to stick the landing on the finality that you are trying to explore. The key ingredient that throws the film a much-needed wrench is a secret in Diane's past. Something that throws some gravel on the smooth road that Jones' film passes on for the first 30-35 minutes. Let's just say she isn't perfect, and that powers her need to give herself to others. Here's the thing. The film doesn't work without Place's phenomenal performance. Other actresses would have taken this role, chewed it up onscreen, and ruined it in the process. Some would have simply under-cooked the dialogue and brushed up against the film like a weak blanket. Place, one of cinema's better characters actors, applies just the right amount of nuance and care to Diane without allowing her to be wholly forgivable. She makes you feel for Diane, especially in a scene where she cuts loose at a bar to a Leon Russell song during a margarita binge. Other times, she makes the screen chilly with a single look. The film marks a breakthrough for the actress. For the past 30 years, Place would have played one of the friends in this movie instead of the lead part. She would have played the support valve instead of the main face. Like Sam Elliott and the late Harry Dean Stanton in recent years, Place gets the role of a lifetime and delivers her finest performance. This is an assured debut for Jones, who directed docs such as Hitchcock/Truffaut and A Letter To Elba. He knows when to let the camera just linger, follow the characters around, or zoom in close on an expression. Sometimes, in these indie enterprises, the filmmaker can try to be too showy or expressive with the camera, and it distracts from the power. These films are taking out a few stills out of ordinary life and exploring the highs and lows. Jones is nimble enough without sacrificing the weight of the story. Diane, executive produced by Martin Scorsese, may not be overly sweet or go down the easiest, but it's an honest portrayal of what's coming while showing a poignant touch. After all, the tale of the tape here is Father Time and its merciless grip over all of us. It's not just a film for the boomer generation; it's something every adult can understand and appreciate. With superheroes flying around this spring, Diane represents a much-needed slice of realism.